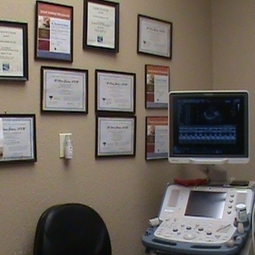 We offer ultrasound specializing in abdominal exams and echochardiograms (ultrasound of the heart and greater vessels). This non-invasive, state-of-the-art technology uses sound waves to painlessly examine specific internal organs, giving our veterinarians a more complete view of internal organs than radiography alone can give. Pregnancy exams are also available.